Women’s roles in our society have changed over the past 50 years with more women receiving degrees and joining the workforce. Nearly 60 percent of women were in the U.S. labor force in 2016, and the proportion of working women with college degrees has almost quadrupled since 1970. In 2016, more than 40 percent of women in the workforce had college degrees, compared with just 11 percent in 1970.1 With more education and employment, women are becoming more financially independent. 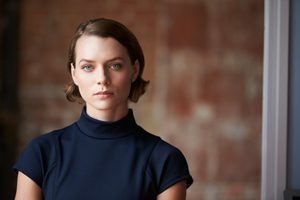 By the year 2030, it is estimated that women will control as much as two-thirds of the nation’s wealth.2 Despite the advances women have made, LIMRA Secure Retirement Institute (LIMRA SRI) research shows that women feel more vulnerable than men about the potential risks they face in retirement. LIMRA SRI research finds women are more likely to retire earlier than men (55 percent vs. 51 percent), however on average they are also out living men by almost five years3. Add to that women are still earning less than their male counterparts (on average female workers earn around 80 cents for every dollar a man earns4), it is not surprising that women are more worried about their retirement security than men. According to LIMRA SRI research, more than 30 percent of women pre-retirees said they felt it was highly likely that they would outlive their assets, incur significant health care costs and have long-term care costs in retirement. However, only about a quarter of men felt these were significant risks. 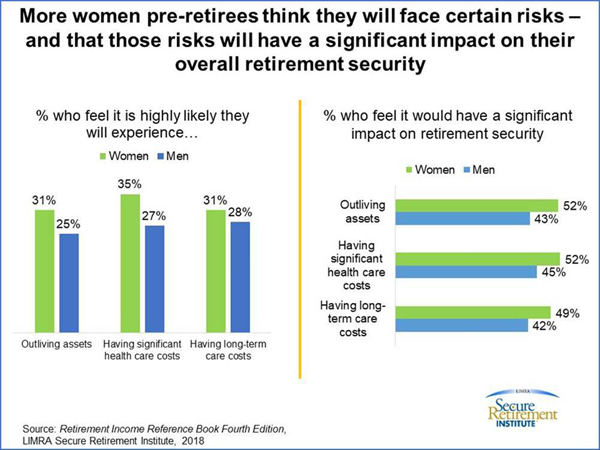 Moreover, a larger portion of women pre-retirees than male pre-retirees felt these events would have a significant impact on their overall retirement security (chart 1). Working with an advisor to address these and other risks that retirees can face in retirement may lead to greater confidence in financial security. Unfortunately, women are less likely to work with an advisor then men and are also less likely than men to have a formal retirement plan (15 percent vs. 22 percent). LIMRA SRI research shows pre-retirees and retirees who have a formal retirement plan save more and are twice as likely to estimate their expected income and expenses in retirement. They also are more likely to assess how many years their assets will last in retirement. As a result, these consumers are three times as likely to feel prepared for retirement. Owning an annuity is one factor that can lead to increased confidence in retirement. Twenty five percent of annuity owners are very confident that they can achieve their desired lifestyle, compared to just 18 percent of those who don’t own an annuity. 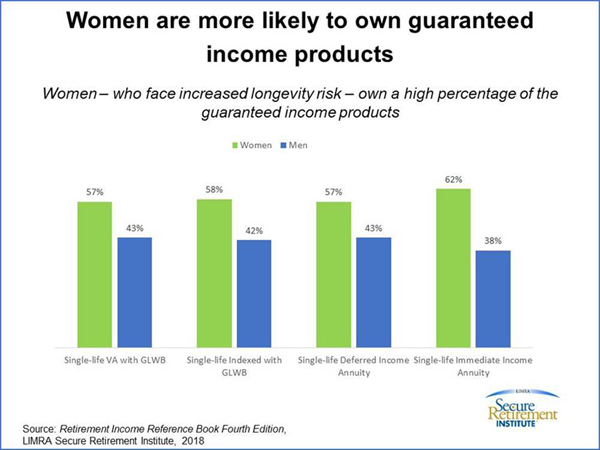 Given that women are more concerned about outliving their assets, it is not a coincidence that the majority of guaranteed lifetime income annuity owners are women (chart 2). In the last week of National Women’s History Month, we encourage advisors and companies to learn about women’s financial priorities and concerns, and their inclination to buy guaranteed lifetime income to better help them prepare for a financially secure retirement.